Singapore's first and longest-running Brazilian Jiu-Jitsu Academy. Come down and train with us! 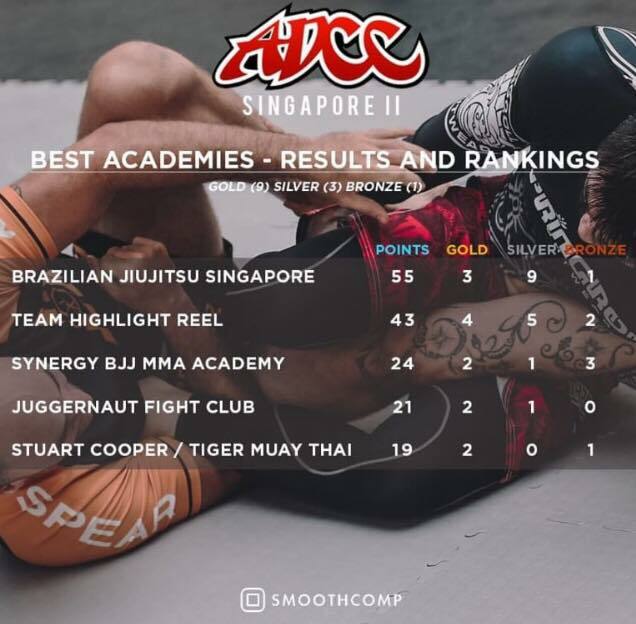 Brazilian Jiu-Jitsu Singapore recently clinched the Best Academy or First Place at ADCC Singapore II. We sent 12 competitors against very tough competitors, and won 3 Golds, 9 Silvers and 1 Bronze, for a total of 13 medals. Not bad, considering almost half of our team was over 30 years (with a few over 45), and competed whilst juggling with work and family. Click here for a free trial class.